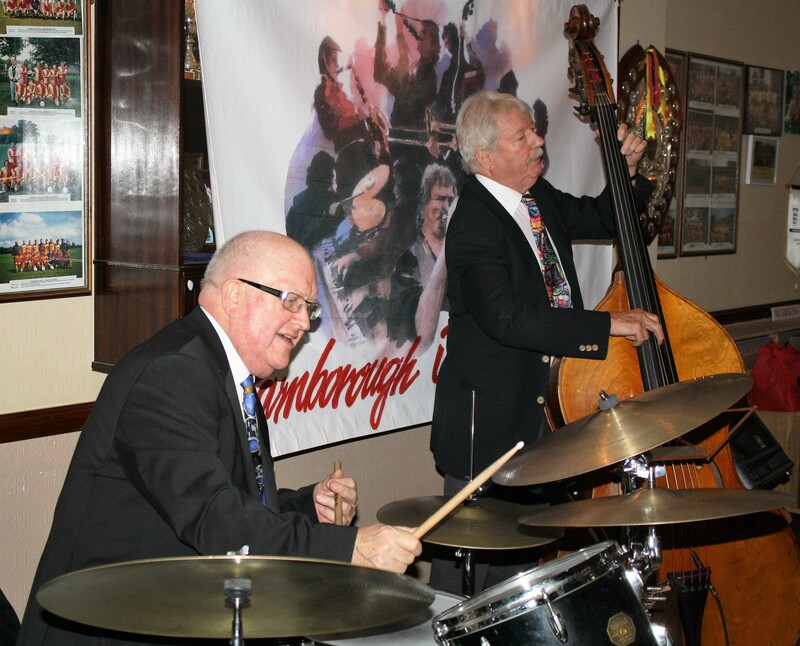 Jackie Free’s Chicagoans play for Farnborough Jazz Club (Kent) on Friday, 5th August 2016. Murray Salmon (double bass) with Jackie (trombone) Photo by Mike Witt. Another Reminder: Please let us know if you wish to attend our Christmas Party on 23rd December 2016. 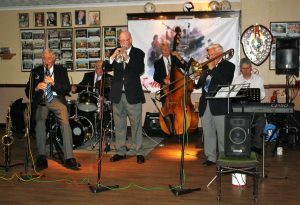 We have the PHOENIX DIXIELAND JAZZ BAND to entertain us. £15 entrance. We plan on fancy dress (your own choice and obviously optional), plus brolly parade. Extra raffle prizes too. You can bring your own food and candelabras and of course, you will enjoy yourselves and that is an order! This entry was posted in Jackie Free;s Chicagoans on December 6, 2016 by Diane. JACKIE FREE’S CHICAGOANS appeared at our FARNBOROUGH JAZZ CLUB for the very first time on 5th August 2016.. What a bountiful of talent in this band. Last week, I said I was quite excited at the thought at them coming, because it is always fun to have new sounds at the club. I just have to put this photograph of Jackie Free as a 24year old, playing with the legend himself. What an accolade Jackie. 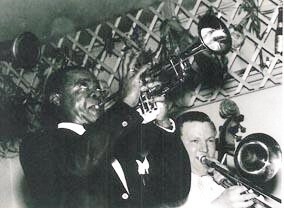 Jackie Free plays with Louis Armstrong in London, 1956. Jackie said it was the highlight of his musical career. He would have been just 24years of age. ©Jackie Free. So now let me introduce you to the musicians in Jackie’s band. 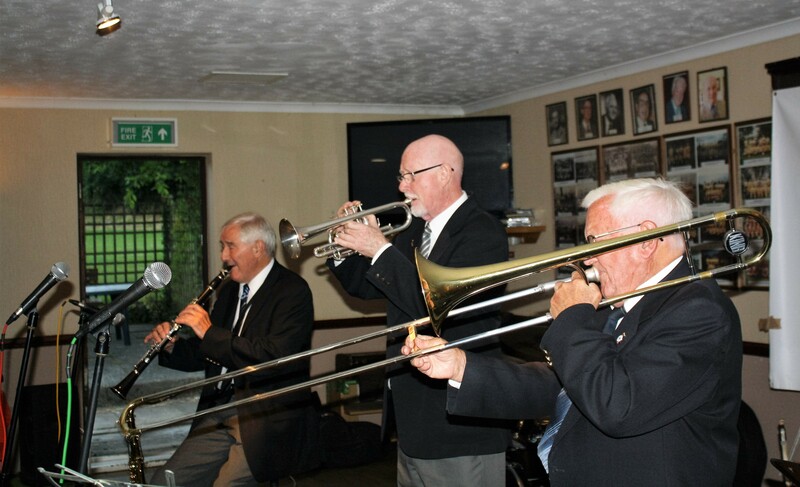 First of all, JACKIE FREE himself plays trombone, euphonium &vocals. 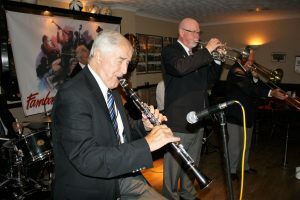 Then, with him was (an old friend) MIKE COTTON on trumpet, JOHN CROCKER on clarinet &saxes, TIM HUSKISSON on piano, MURRAY SALMON on double bass and MARTIN GUY on drums. Great front-liners John Crocker on clarinet , Mike Cotton on trumpet and Jackie Free on trombone playing with ‘Jackie Free’s Chicagoans’ at Farnborough Jazz Club (Kent) on Friday 5th August 2016. Photo by Mike Witt. They have all played here individually with other bands, apart from Murray. 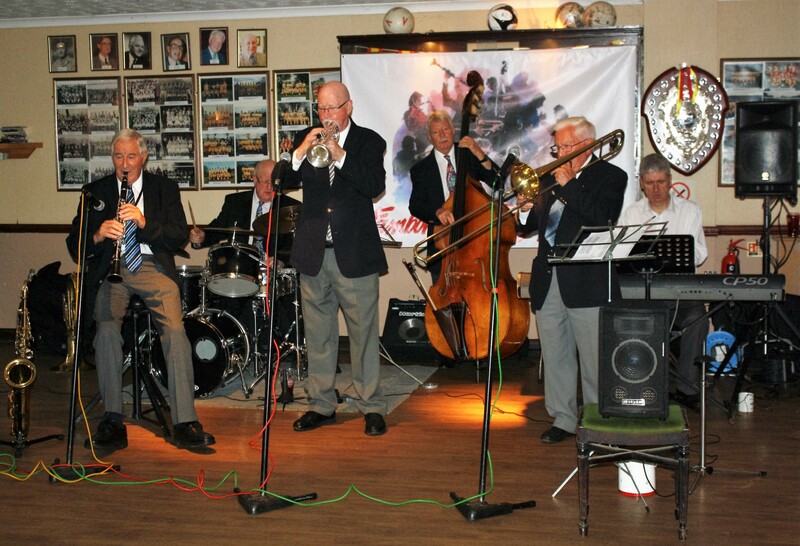 We were originally to have Pete Rudeforth on trumpet, but he needed to (understandably) bail out for a gig with Chris Barber in Belgium, then we were to have Gary Wood. Unfortunately Gary was taken ill at the last minute and unable to make it, so Mike kindly stepped in. Phew, what a line-up we had anyway, aye, one you just couldn’t miss. John Crocker had been abroad for several weeks, so asked if we had missed him. I of course, said ‘No’ (with a question sound to my voice). ‘Fickle’ was JC’s remark back – ha ha. Of course anyone would miss him – what a player aye! Well he was with Chris Barber for 30yrs, plus he played for Elton John. With such players, Jackie had to be special, to command such talent and so, yes it was a special evening and if you missed it, hard luck. 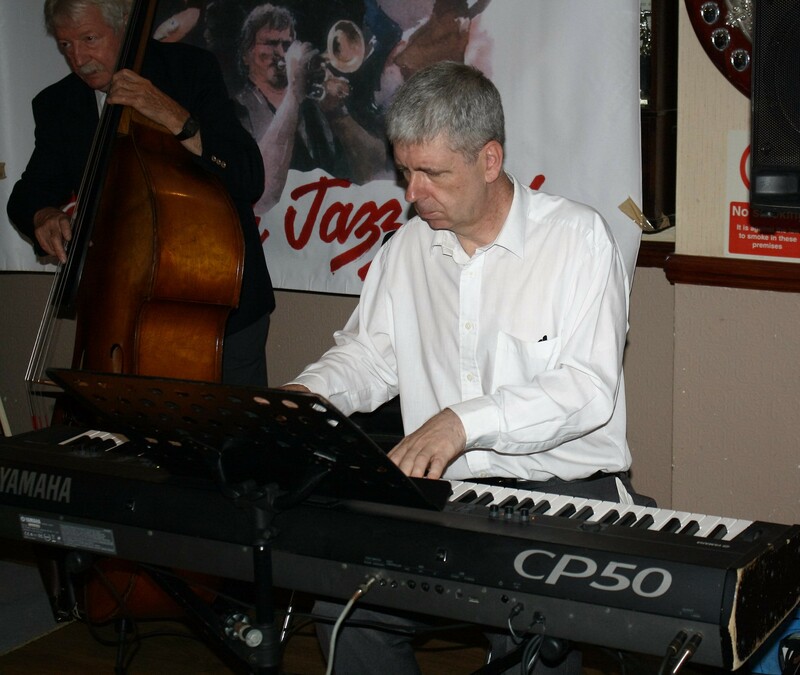 Jackie Free’s Chicagoans play for Farnborough Jazz Club (Kent) on Friday, 5th August 2016. 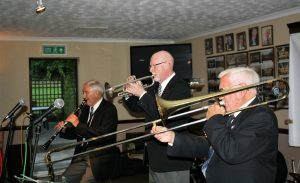 (LtoR) John Crocker (clarinet &alto sax), Martin Guy (drums), Mike Cotton (trumpet), Murray Salmon (double bass), Jackie Free (trombone & euphonium) and Tim Huskisson (piano). Photo by Mike Witt. Let me dangle some of what was played! They began with ‘Back In Your Own Back Yard’, a happy number sung by Jackie, hey another super jazz voice (so many great voices about). My next to mention to you is ‘Black and Blue’, quite a favourite with most, especially with this lovely hot weather, as it is a slow tune and allows us to dance with far less chance of collapsing!! 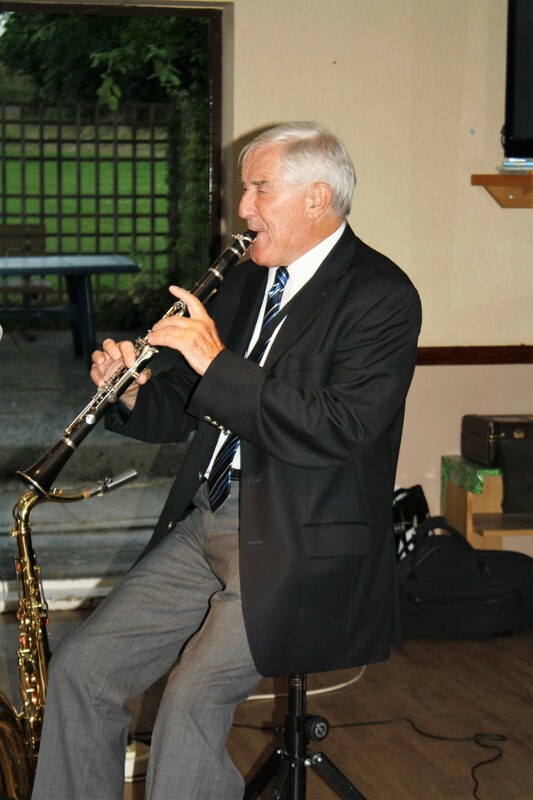 John Crocker plays clarinet with Jackie Free’s Chicagoans at Farnborough Jazz Club (Kent) on Friday, 5th August 2016. Photo by Mike Witt. I must mention John’s special feature. Tim played a beautiful intro, with John playing exquisite tenor sax to ‘Tangerine’, mouth-watering stuff (he can repeat it anytime he likes here). Then came almost the highlight of the evening (if everything else hadn’t been so wonderful before). (I know the picture shows John playing clarinet). Anyway, Jackie asked if he may play the euphonium. He used to play it over forty years ago, then gave it to his son. When he found out his son still had it, he retrieved it and found he could still master it. The tune he played is such a beautiful one and he played it superbly. How on earth could he worry we might object!!!!! The number was ‘Blame It On My Youth’, gorgeous. Such a shame we didn’t have a photo of him playing it, but next time perhaps. They played ‘Chicago’ next and we managed to get a little line-dancing in. 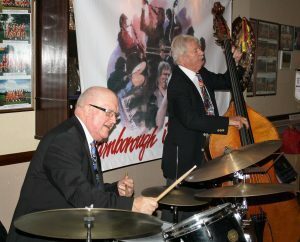 Martin Guy on drums and Murray Salmon, on double bass – part of the ‘engine’ of ‘Jackie Free’s Chicagoans’, seen here at Farnborough Jazz Club (Kent). Photo by Mike Witt. 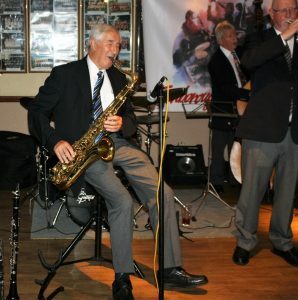 I remember the next number had some lovely solos, but would like to make special mention of Martin and his fantastic drum solo with ‘Struttin With Some Barbeque’ and of course they all excelled with ‘At The Jazz Band Ball’. It was just lovely to have Mike back in the old place again, not having seen him for possibly twenty years, or more. So to hear him featured with ‘Georgia On My Mind’ was lovely, his trumpet playing was so pure. He then sang the next one too, ‘Kansas City, Here I Come’ and even topped it by playing a mouth organ too. Hmmm. 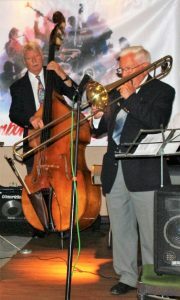 John Crocker plays tenor sax, Mike Cotton on trumpet and Murray Salmon on double bass, with Jackie Free’s Chicagoans at Farnborough Jazz Club (Kent) on 5th August 2015. Photo by Mike Witt. Must include this photograph, with John playing tenor sax – you have captured a wonderful stance just great Mike. Thanks everyone for such an enjoyable evening, it is wonderful, once again to enjoy such talent, on our own turf too. P.S. At long last, I have published the newsletter of our Halloween Party last 30th October 2015, complete with some lovely photos of our Witches from the Farnborough Coven. Take a look back, you will enjoy what we got up to!!!! This entry was posted in Jackie Free;s Chicagoans on August 8, 2016 by Diane.